"Chris Pratt made a special visit to the House. He spent time hanging with families and even made a special visit to Paige. Because of her weakened immune system, Paige must stay in a post-transplant suite where she has limited contact outside of her room. 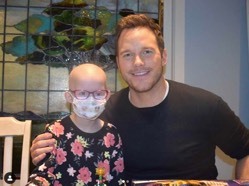 Thank you to @prattprattpratt and #mdcproductions for bringing this unforgettable experience to Paige and all the families staying at the House," the organization posted on Instagram. "Hug your babies. I had the chance to meet some awesome kids today. I am so blessed. Thank you to @rmhnewyork for the extraordinary work you do with children. Thanks for giving me the opportunity to share in their light. My heart is full. Thanks to Lego for sending over a crate of toys for these little ones to enjoy. Hug your babies," he wrote in an Instagram post. "Bye-bye, New York! Made a bunch of friends today. Thanks to Nori, Emmalyn, Caleb, Eli and McKenna for my new bracelets. And to all the other kids who made drawings and cards, thank you as well. Love you! 2 Corinthians 9:8 And God is able to bless you abundantly, so that in all things at all times, having all that you need, you will abound in every good work," he said. Last fall, the two brothers came together to support The Leaven at the Christian organization's annual "Mayor's Gala" event. "They are the solution. I've been in law enforcement now ... coming on 16 years," Pratt said. "And this is one of the best programs that I've seen to where [police] departments involved, fire departments are involved and leaders of the community are involved."